Hi, I've been a scrap-booker for 10+ years. My husband thought it would be a good idea to make cards, so he signed me up for card classes as a gift. I told him-- NO, NO, I already have paper issues!! He said, just go, what can possibly happen? 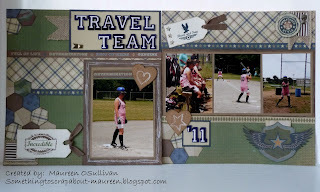 Well, some 4 years later, I have a blog, sell CTMH products and hold card classes at my house! A lot has changed! During my transition from scrap-booking to cards, I was always fascinated by the cute things crafters would create. 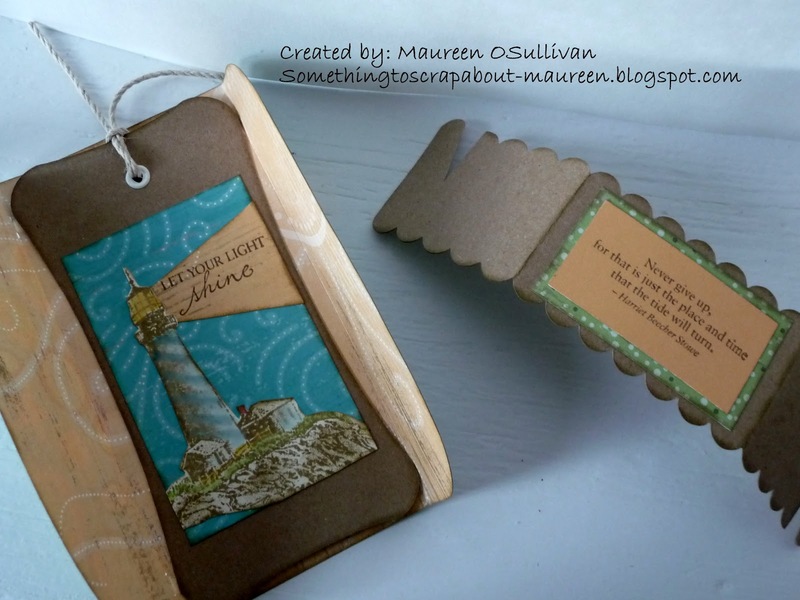 Sometimes they would use special dies or even worst trace items by hand and cut them out. The Cricut Art Philosophy Cartridge changed this and the new one, Artiste, has even more 3-d objects, cards, tags, envelopes and shapes. In addition to cutting out the objects, the Artiste cuts small score lines that make folding simple. 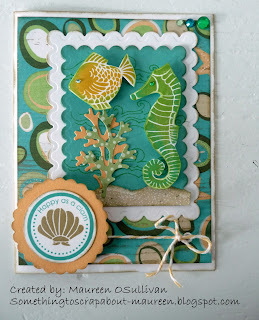 Below is what I was able to create with the new CTMH Artiste cartridge. 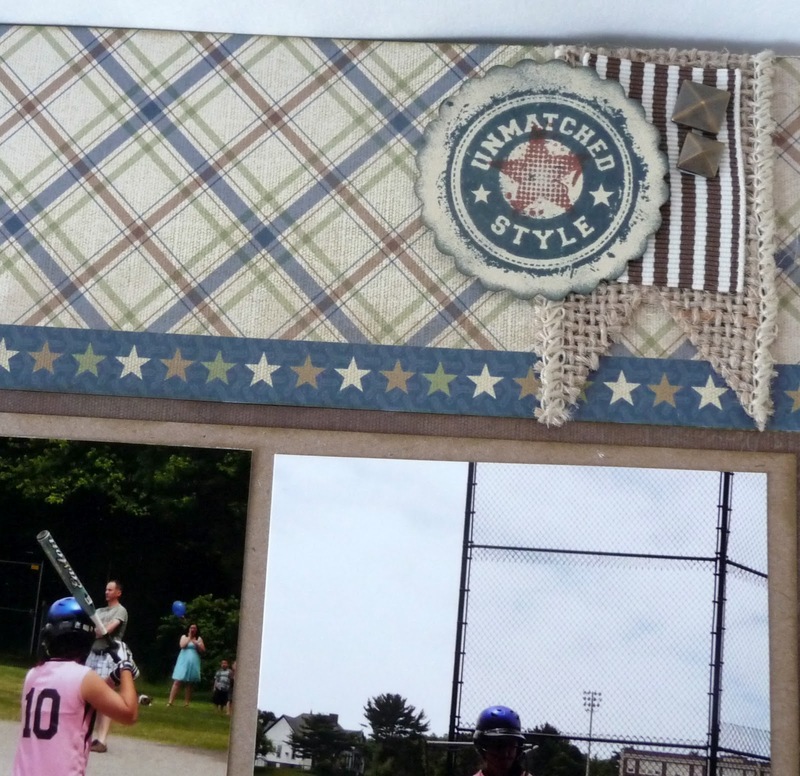 I just put in craft paper on my cricut mat and cut a 6 inch bookmark. Next, I cut the coordinating Footloose cover and band. I was soooo easy. 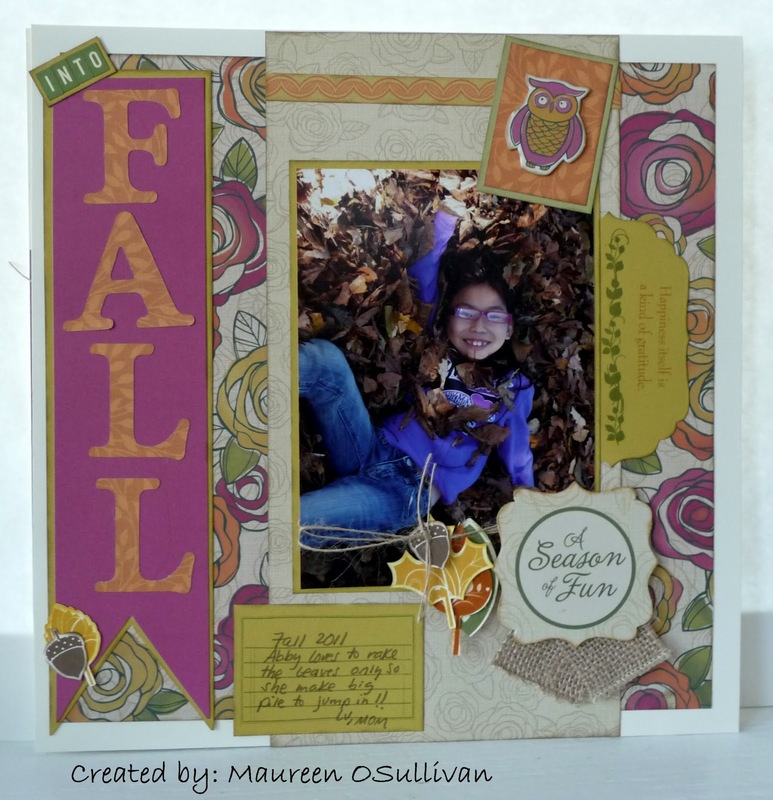 Dies can cost $20-$50 each. 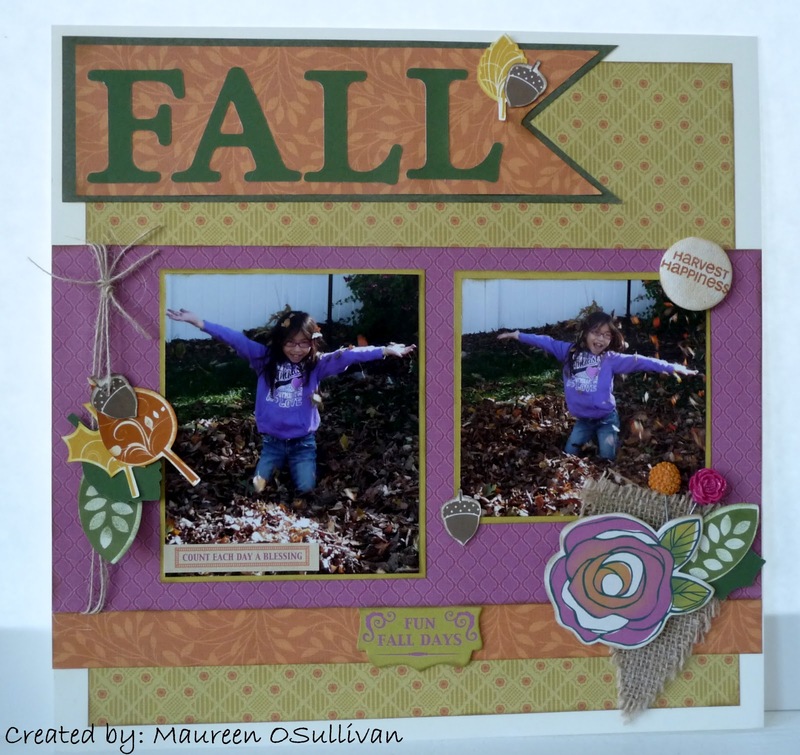 The Artiste is a bargain at $99-- 700 images, 3 stamp sets, and 3 sets of dimensional shapes. Thanks to Artiste, I now look like a professional! And, if I can look this good, then anyone can b/c it is sooo easy! Give it try, you won't be disappointed. 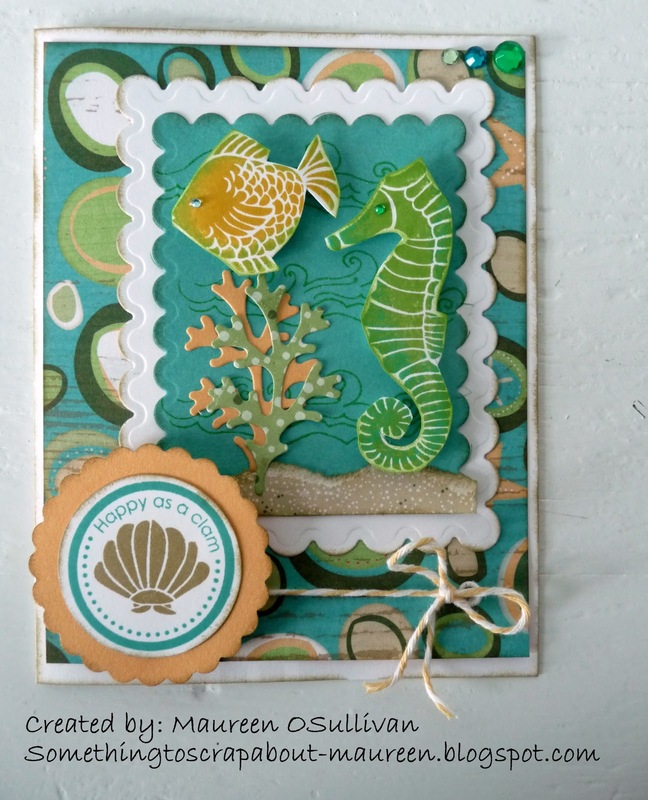 Hi, when it gets close to my birthday in August, I know the summer is drawing to towards an end:( In an effort to stretch the summer out, we made this fun card at our last card gathering. To get the all the different colors on the fish, we inked it first in Honey and then rocked the edges in Pear and then in Lagoon. 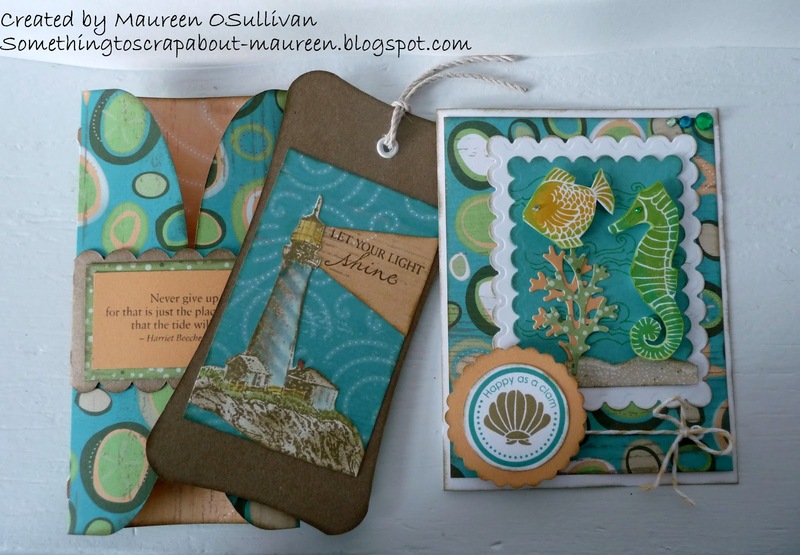 The seahorse was inked in Pear, then lagoon. 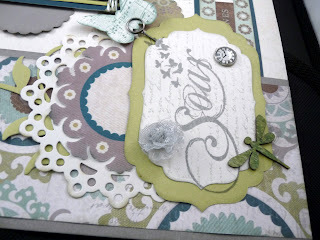 The stamp set and papers were part of the Footloose Workshop on the Go kit. I can't wait to use this paper line on my St. Martin pictures! Enjoy the last few weeks of summer and be "Happy as a Clam"! 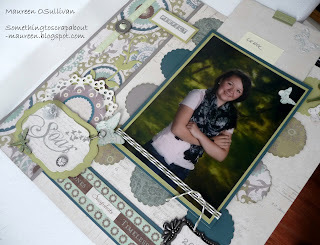 I have been scrap-booking up a storm lately! I had these pictures of my daughter Abby from last Fall. I was planning on using the CTMH retired Dream-in kit, but once I saw the CTMH Flirty line, I knew it would work. As always, I looked at the Workshop instructions and came up with my own LO. 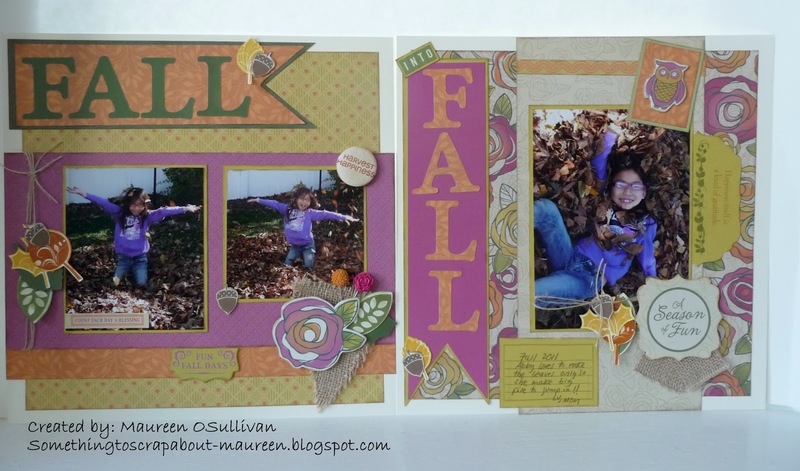 The name of the LO is "Fall into Fall". My daughter loves to rake all the leaves into a pile and them jump in them! To complete the LO, I used CTMH's new Burlap, which gives it a rustic look. 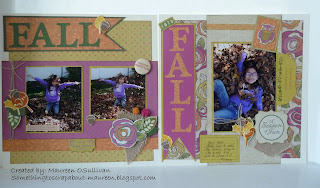 I then stamped leaves in many fall colors and strung them on the sides of the photos. The Flirty Dimensional shapes also came in handy. 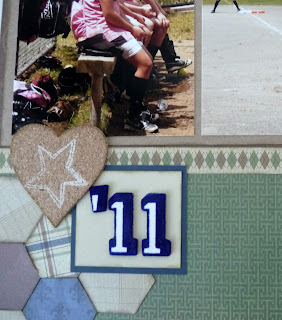 CTMH Supplies: Flirty WOTG (G1050)-- includes Flirty paper, Dimensional Shapes, C-size stamp and Bling. 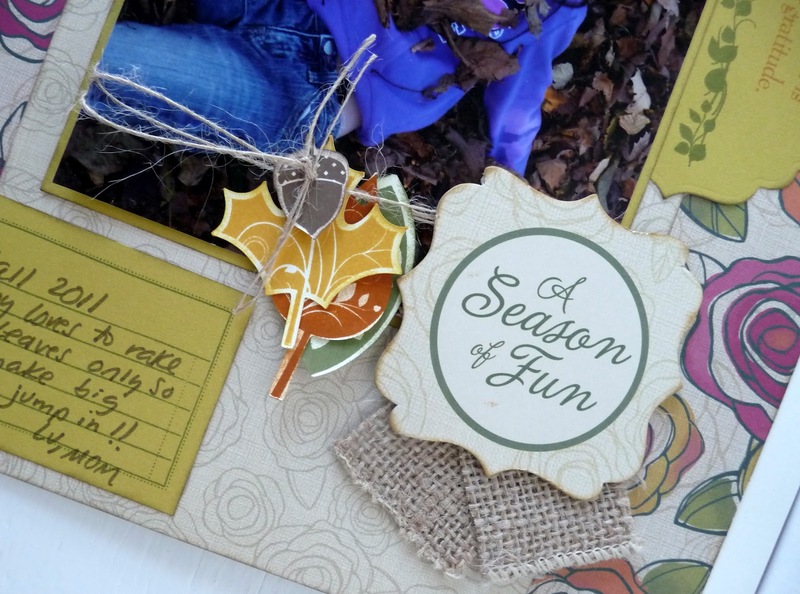 Other Supplies: CTMH Burlap (Z1760), Autumn Lane Assortment (Z1749); Canvas Buttons, Happy Harvest Stamp Set (C1463); and CTMH Art Philosophy Cricut Cartridge (Z1686). Inks: Autumn Terracotta, Sunset, Honey, Desert Sand, Chocolate, and Topiary. While Shaelin was gone, I created this 2 page LO using CTMH's Victory WOTG. 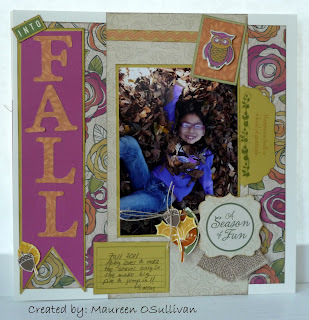 The WOTG kits are only $29.95 and include a C-sized stamp, paper pack, instructions and at least 2 embellishments. 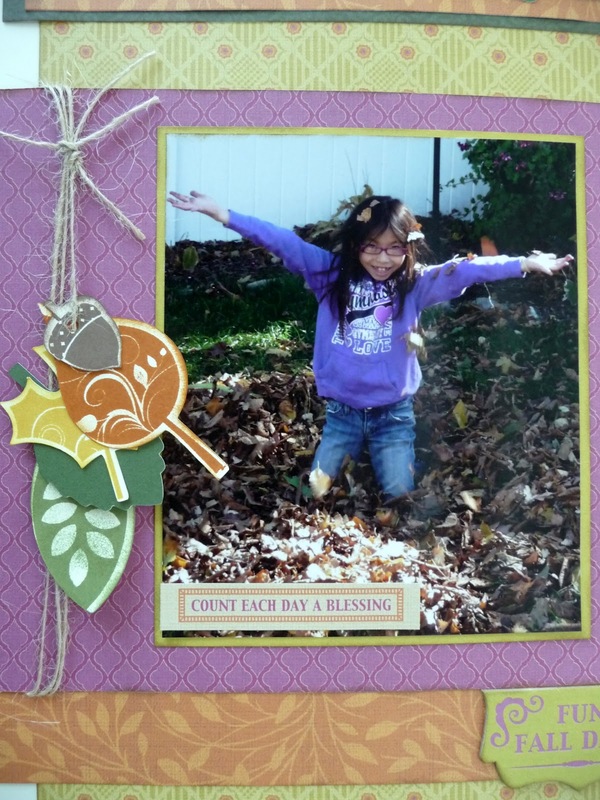 The CTMH Idea Book is also a source of inspiration. I loved the one page LO on page 35. Hexagons are so in and so easy to make. 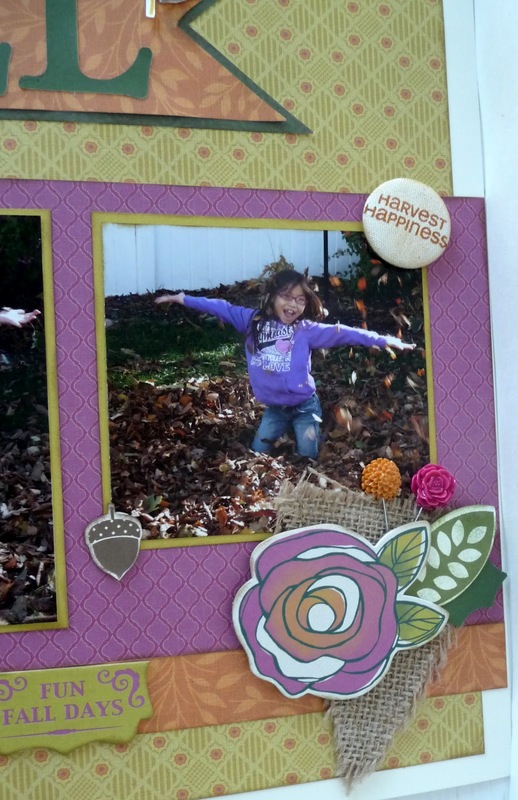 CTMH's new burlap camp in handy, as well as CTMH faux stitching stamps. Well, I hope my daughter likes the LO! If you need this kit, then let me know. I have one extra one in my stash. All supplies are CTMH, with the exception of the "Travel Team" title. 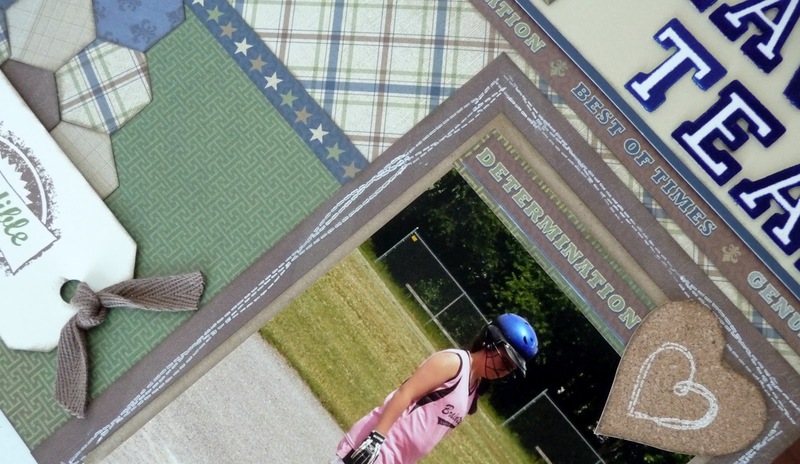 Supplies: Victory WOTG (G1035), Dark Chocolate Gross-grain Ribbon (Z1617); Burlap NEW (Z1760), Cork Shapes (Z1719), CTMH Cricut Art Philosophy cartrige (Z1686), Durables Studs (Z1705). Inks: Denium Blue, Chocolate and Barn Red. White Daisy Chalk for stitching. Back again with another LO-- I was very productive at the weekend crop! Another new paper line from CTMH is Avonlea. Avonlea is a gorgeous combination of blues, greens and greys (slate). 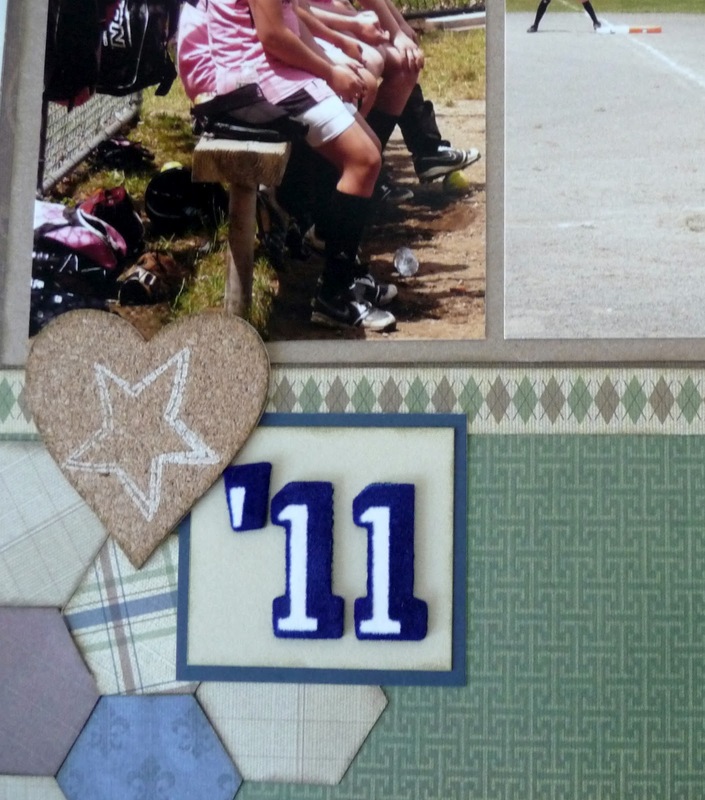 The coordinating embellishments are canvas shapes that can be inked up to match your stamped images. 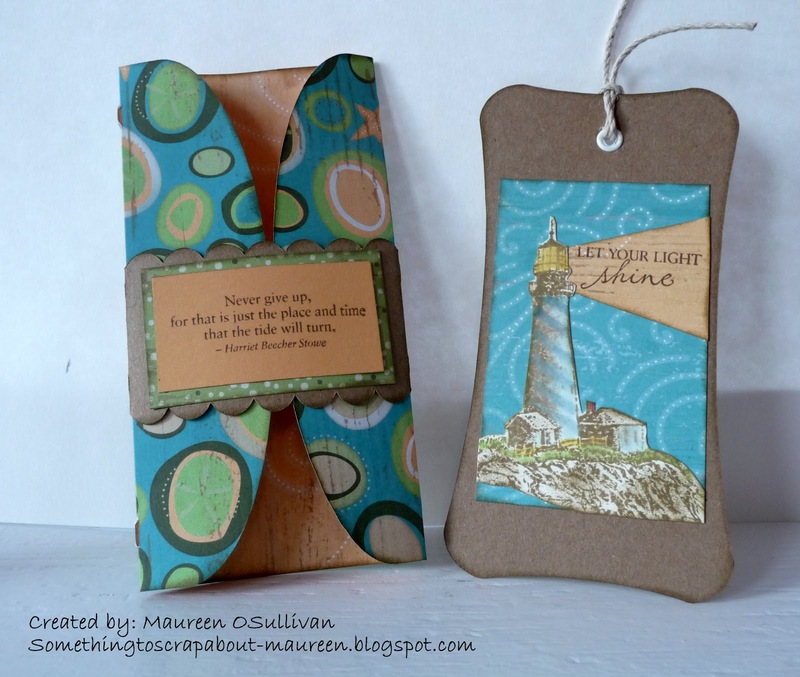 As you may have seen from my 7/22/12 post, I'm loving CTMH's July SOTM. 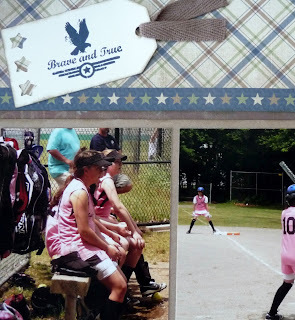 The sayings are both cool and motivating-- something that fits perfectly for a 14 year old, moving onto HS! The sentiment 'Soar' really resonated with me b/c my daughter has changed so much from Elementary School, to Junior High, and now onto HS. All of the supplies, with the exception of a few die cuts, are CTMH. Check out the supply list following the pictures. 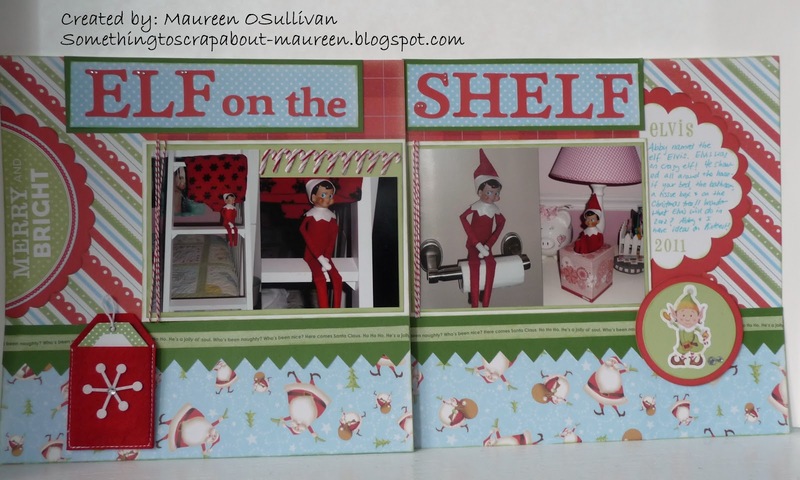 Hello, well the 'Christmas in July' crop hosted by Creation Destinations (The Crop Shop in Rockland) and Scrapbook Village really inspired me to finish up my Christmas LO's! 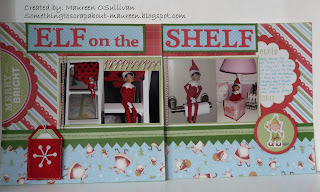 In 2011, our household was lucky to have an Elf on The Shelf, named Elvis, come and visit. And true to his name, Elvis liked to cause havoc!! As the pictures below show, Elvis was found hanging around my daughter's bunk bed, in her tissue box and also in the bathroom sitting on the toilet paper roll!! Wonder what the Elf on the Shelf will do this Christmas? Thanks to Pinterest, we have lots of ideas! Supplies: CTMH Mischief Paper and Stickers; CTMH Art Philosopy Cartridge for shapes and leters; and CTMH inks: Holiday Red and Pear.